The best thing about this film is that it is bound to disappoint a million Twilight fans. I actually have a lot more respect for Robert Patterson now, by the fact that he was willing to shatter his ‘pretty-boy’ image with a role like this. In one scene, Patterson’s character stands in a moving limousine getting his prostate examined, while having a serious business conversation with a female co-worker. Needless to say, it’s quite uncomfortable to watch. But his performance is somewhat admirable… almost likeable. He is introduced to us as a snooty rich kid demanding to get a haircut, and yet as the film unravels, so does the character. He slowly descends into his own mad world of self-sabotage and isolation. It isn’t too long until Patterson starts to have fun with the character, demonstrating the same psychotic magnetism that Christian Bale showed us in American Psycho. The story is simple. 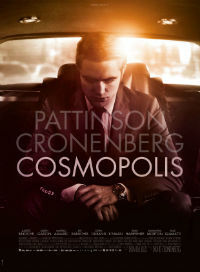 It’s about a rich billionaire, Eric Packer (Patterson), who asks his limo driver to take him across town for a haircut. While driving, Eric meets with various characters, including several business associates, his wife, doctors, security guards, protestors, mourners, family friends and teachers. Chance encounters with his wife (played by newcomer Sarah Gadin) are probably the most interesting, as well as the lengthy exchange in the final scene. Dialogue is what makes this film better than average. While it’s sometimes hard to work out what they’re even talking about most of the time, the delivery is quick and captivating thanks to the talented cast. The supporting ensemble features many familiar faces, which is surprising considering the little screen time that most of them get. There’s Jay Baruchel, Samantha Morton, Kevin Durand and even Juliette Binoche (although I have no idea what the relationship was between those characters). The worst thing about this film is that I’m not really sure if I even understand it. Most of what happens relates back to the opening quote in some way or another, “A rat becomes the unit of currency”, but I don’t really get what that means either. I think everyone who watches this film will have a slight understanding about the statement David Cronenberg is trying to make, but it’s not until drinking a beer and discussing it afterwards that you can really appreciate it (a reference that will make more sense after seeing it).